The second volume of 'Manchester Sounds' (the first volume of which was reviewed in BMS News 88 December 2000) has just arrived on my desk -and, at the same time, an intriguing collection on CD of music 'by composers with Manchester Connections'. 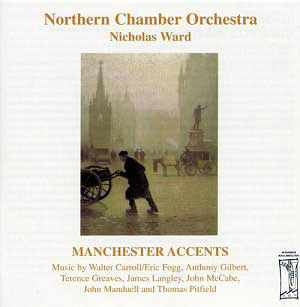 If provincial northern accents predominate in the periodical, there is an urbane eclectic variety in the selection of pieces on this disc, ranging from the orchestrally clad Walter Carroll miniatures (whose choice of Rackham drawings on the covers of the published piano sheets beloved of children is paralleled here in Eric Fogg's imaginative scoring) to the complex music of Manduell's 'Diversions' and the dark modality of John McCabe's 'Dances' for harp and strings (from the Scottish Ballet's production of 'Mary Queen of Scots') This range encompasses, en route, a Rondino movement for piano and small orchestra, originally belonging to an early Piano Concerto by composer Terence Greaves, whose delightfully capricious music is played with the most delicate lilt by the young Jonathan Scott (whose progress I will continue to watch with the keenest interest) and the ravishing Theme and Variations of Tom Pitfield. While the respected Carroll is justifiably regarded as 'the father of Manchester composers' (especially for his community work with children and their music making) it is to Pitfield's richly evocative harmonies, recalling Warlock and Moeran, that I return most often. It appears that this work was rejected by readers at the BBC as 'suitable for a school orchestra' - which says something perhaps about the comparative values, even discernment, of the respective musical centres of the north and the metropolis. It is to be hoped that the centenary of Pitfield's birth in 2003 will afford a hearing 'in depth' of the range of this fine composer's work. 'descriptions of Divertimenti finales are generally superfluous� I leave this exciting music to speak for itself. Contrasts also in the statuesque incidental music of John McCabe and Anthony Gilbert's Another Dream Carousel (are there more?) - an almost nightmarish waltz sequence whose nostalgia seems to be lit by the flashing kaleidoscope colours of the ever-turning roundabout. If one needs a reason to compile a recording of varying and attractive music, yet with a similarity of accent, then the idea of a regional bias is not inappropriate - and I imagine that, with the material that may yet be available and unexplored further compilations may appear. If they are of this standard then I eagerly anticipate.